In the music world, the singer’s voice is regarded as another musical instrument. Like any other instrument, the production of voice requires 3 key components: 1) A Generator – Much like plucking the strings of a guitar or pushing the keys on a piano, a force is required to create a vibration in the instrument. In humans, this force is provided by air moving from the lungs across the vocal folds. 2) A Vibrating Component – The skin of a drum vibrates when struck, so too does the reed of a saxophone when air is pushed across it. The vocal folds also vibrate as the lung push air across them creating a sound. We can change the pitch of that sound by lengthening or shortening the vocal folds. The volume of sound depends upon how much air we are pushing out from our lungs. 3) A Resonating Component – Without the wooden cavity, a classical guitar would not produce the sound we expect. 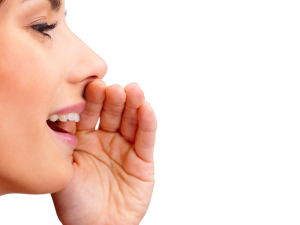 Our voice is also modulated by the cavities of the throat, mouth, nose and sinuses. This gives us the characteristic voice qualities that are unique to every person. “Vocal Folds” is the modern name for vocal cords. They look like a V-shape and can normally open (to let air move into and out of the lungs) or close (for airway protection and voice production) under our control. They are covered by a soft elastic lining that can vibrate at high speeds. This creates what is known as the mucosal wave. Normal voice production requires the vocal folds to meet completely in the midline (centre). Air rushing across them causes vibration at around 130 times per second in males and around 180 times per second in females. This higher frequency vibration (faster vibration) is why female voices have a higher pitch than males. The volume of our voice depends on the pressure from the lungs blowing across our vocal folds when they are closed. Stronger lung pressure will increase the volume of the voice. This loudness requires the vocal folds to tense and come together completely. People with vocal fold paralysis, or other causes of vocal fold weaknesses, cannot do this and the pressure is let out too quickly. They often complain of a weak voice or an inability to raise the volume of the voice. Pitch refers to the frequency of a sound and can be described as higher or lower. Like a piano or guitar, the pitch of the voice depends upon the length and tension placed upon the strings. This is why men (with longer vocal cords) on average have a lower pitch than women (with shorter vocal cords). The muscles in the larynx can also change the tension of the vocal folds, tightening them to increase pitch and relaxing them to decreases pitch. A person normally does this subconsciously many times per second. Quality is caused by regular mucosal wave vibration in the vocal folds. There are a lot of factors which can affect mucosal vibration, but the key two are vocal fold closure and vocal fold pliability Vocal Fold Closure- depends upon the vocal folds coming together in the midline (centre). Vocal fold paralysis (or weakness) may prevent this from happening. Sometimes masses or lesions on the vocal folds (such as cysts, polyps or nodules) may prevent them from closing properly. This causes a ‘hoarse’ sounding voice. Vocal Fold Pliability- depends upon a special “jelly like” layer of the vocal folds called the lamina propria. In some conditions (such as vocal fold scars), this layer is deficient which causes abnormal vibration and and results in hoarseness.